This show has been cancelled due to inclement weather. The box office will be contacting ticket holders directly. 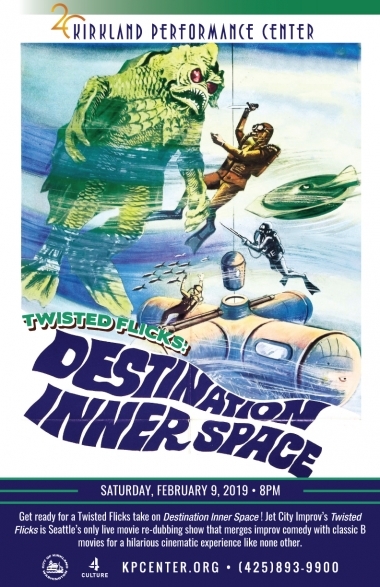 Get ready for a Twisted Flicks take on Destination Inner Space! Jet City Improv’s Twisted Flicks is Seattle’s only live movie re-dubbing show that merges improv comedy with classic B movies for a hilarious cinematic experience like none other. What is Twisted Flicks? As the film plays, the improvisers create all new dialog for the characters, sound effects, and live music – completely improvised using the suggestions provided by the audience! Jet City Improv is dedicated to enlightening, educating and entertaining audiences of all ages by producing theatrical events that explore theater through its improvisational roots. Jet City Improv’s goal is to bring the art of improvisation into the mainstream thought of everyday culture. 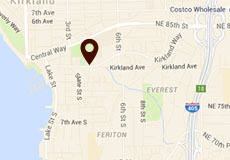 Jet City Improv performs six shows every weekend at their bright yellow theater in the University District of Seattle, and now look forward to an Eastside partnership with Kirkland Performance Center. Over the course of any given month, these shows may include feature length shows (unscripted plays), their flagship Jet City Improv show, and their popular improvised re-dubbed film events known as Twisted Flicks. All Jet City Improv performances are produced by Wing-It Productions, a 501(c)3 non-profit organization.